Over the past 8 years I have been approached 45 times by clients who want a tiny house built on their property. The workshop results in a framed tiny house for the client and an intensive learning experience for workshop participants. Part of the process is that 90% of the material is pre-cut, allowing us to build from foundation to roof framing in two 8-hour days! The pace is that of commercial construction “Go, Go, Go.” Fours walls are up on day one. The instructional style is geared toward absolute beginners with every step explained. The workshop pace and objectives are of such a scope that the projects taken on need to be orderly and follow a clear operational order. The project is plain vanilla, simple boxes with a twelve-twelve pitch roof. In reality this is not a tiny house building project, but rather a two day framing and sheathing instructional workshop. The workshop costs $250.00 and goes from 9:00AM to 5:00PM on Saturday and Sunday. Meals and lodging are not included. However, camping is usually available on site. The ideal student is someone who wants to build their own tiny house, but lacks the confidence and experience to go it alone. Students can expect to get help learning how to put together a materials list. 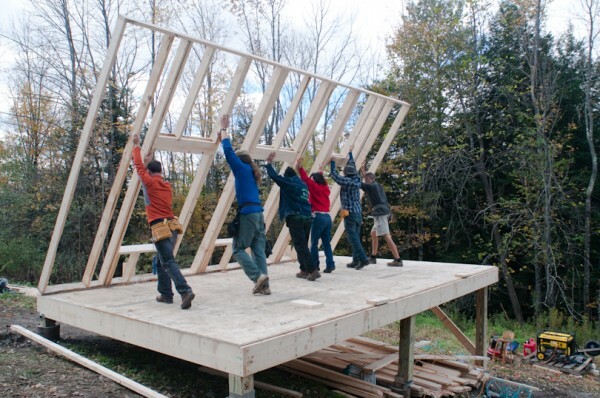 The ideal sponsor for a tiny house project is someone who, having been given a great head start with the framing and sheathing through the workshop, expects to be able to finish the house on their own or with local hired help.